It seems the increased interest after congress have continue to impacted to the statistics in google search. According to these (corrected) statistics, the number of flat earth believers started to increase again and arrived to 46,5 millions. This is the highest number of the believers. It seems a combined results shown on buddha. Such as problems may be occurred. Right, you aren't even doing how often it is searched, you are merely seeing how many results there are. That doesn't indicate if people believe it. This includes results which point out it is a load of crap. I googled flat Earth to find this place, and I don't believe for a second that the Earth is flat. You googled it because maybe even on a subconscious level, the concept peaked your interest in it. Maybe even to the point where you for a fleeting moment become 'woke' to the reality of a flat earth. Millions of people every day are googling flat earth. It is clearly something that people are thinking about and pondering. Flat Earth is belief system. Religion. Otherwise people wouldn't have to compare it with other religions. On the other hand, Globe Earth is based on facts. FE is not based on measurements. GE is based on measurements. FE map can't be made. No way to show accurate proportions of distances on flat surface. GE map can be made with accurate proportions on globe surface. On flat surface you can't maintain proportions accurately. Ever tried to cut and stretch ball to flatten it on table? If the Earth was flat, it would be easy just to divide all distances with same number, let's say 1000 000, and draw it on flat paper to get good map of the whole Earth. That would accurately show every kilometer in every direction as one millimeter, and all continents and oceans would keep their correct shapes. Dividing with 10 000 000 would show every 10 kilometers as one millimeter, and so on. Come on, this is just a statistics aim to determine the number of flat earth believers with compared to the beliefs as religions. We may put any other thing instead of beliefs. The result doesn't change. It doesn't make a sence that compared to the beliefs to be religions or anything else. 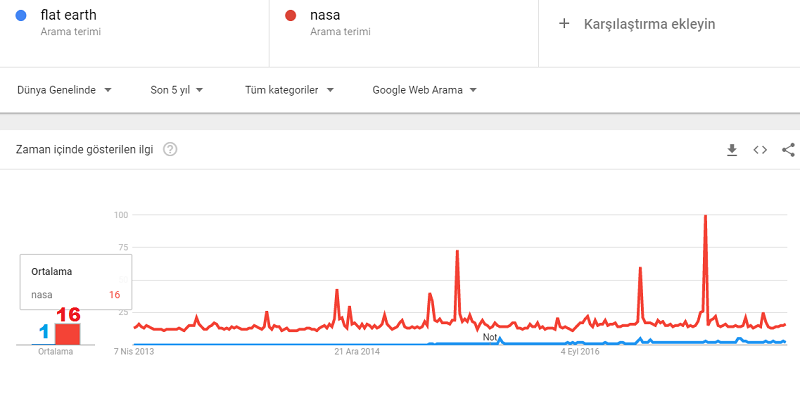 If you'll get convinced, we may do it by compared to the search term by NASA, will it make the term scientific? Ok, no problem. We may agree it as an irony. Nope, won't make it anymore scientific, because the method is flawed at it's core. You're not getting useful data here. And it is a fundamentally flawed method which is unable to do that. You are just looking at the number of search results. That does not indicate how many people are interested in it or how many people believe it is true. Does this mean more people believe in Star Trek than believe in pineapples? And more people believe in pineapple, than pineapples? Yes, things like Jesus, Buddha, Hindu and Flat Earth. This confirms Flat Earth to be just a belief system. If we combine this with list of all things that have to be denied for Flat Earth to be believed in, it gives us deeper insight. I may add there NASA; so will it be the comfirmation of the NASA's to be a belief system in your childish mind? 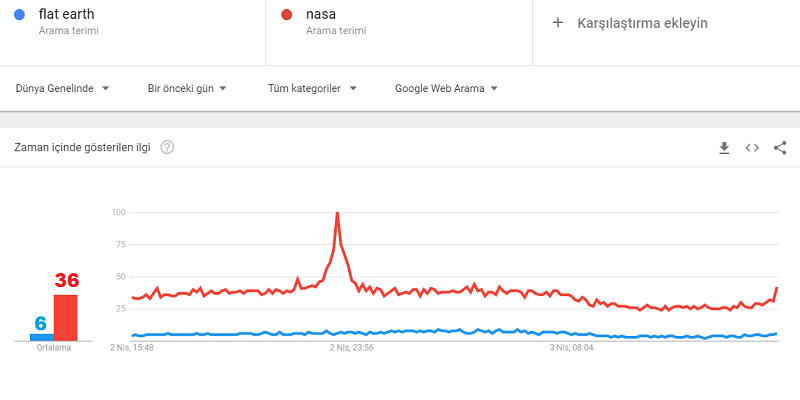 Adding NASA to the list of denial just additionally emhasizes the point. If you agree NASA as a belief, so surely. It's a statistic allright but it's a long long stretch to imagine the number of viewings/visits bears any relationship to the total of FE believers. I'd bet a lot of these viewings are (1) repeat visits by the same people, and (2) a very substantial proportion - probably a majority - of these visits are people who a merely curious, who want to see if there are literate people who seriously believe in a flat earth and why kind of arguments & evidence they have, or (3) also a very substantial proportion, visits from people who want a good laugh at Flat Earthers. My own estimate is that the number of true believers in a Flat Earth who are also members of this forum number in the few hundreds, possibly less than 300 (the other members like to argue for a Round Earth). Outside this forum the "believers" probably include people who are not literate enough to handle a computer or are otherwise so benighted that you'd be embarrassed to count them as teammates. It is caused by maybe an update, so that the general searching rates are decreased. So that, we need another calculations for define the number of search/number of belief relevance. Populatin /search number: 7.615/746= 10.2 people per search. It seems about 2 times more than the number in February. 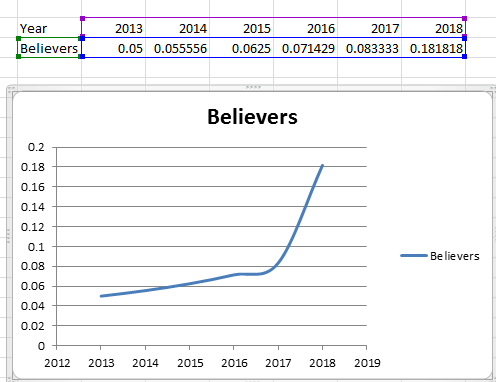 This is caused by, either really the number of believers are increased, and/or the calculation method is changed. Round2: Comparing believers of NASA and FE. If we pre agree, every man "have to believe either NASA, or FE theory", we may find out the increased values. 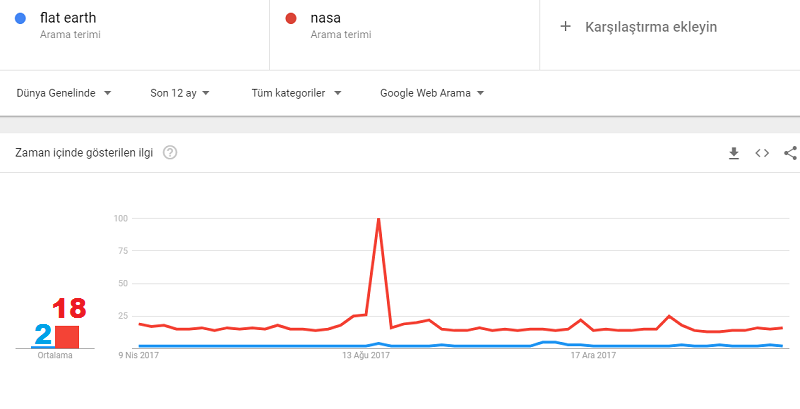 Google trends shows us the general tendency of the people. Comparing the trends for "last 5 year", "last year", "last 3 months", "last month" and "last week". Now. We see the general tendency of the Flat earth is arrived at 1/6. It was about 1/7 in 3 months ago. In 3 months, the interest to the FE theory increased about 17%. Now. Lets try to draw a graph of show us general increase rate of the flat earth belief. 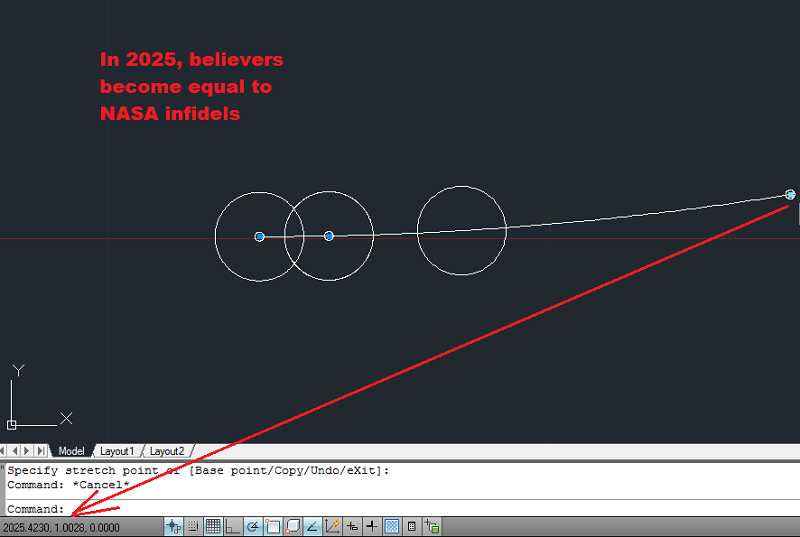 In 2025, number of believers become equal to infidels of NASA. This is later from my estimation was about 2020-2021. Sad. We should do something to improve the process. Search does not equal belief. Just look at your "believers" forum! We consider you as frequent member to be a flatearth sympathizer...those are also practical in spreading the message ! Yes, those are also practical in spreading the message that the flat earth is a recent quite ridiculous invention! each and every event assumed to have taken place prior to 1780 AD has been totally forged/invented/falsified. History is just some 365 years old (I started with a figure of 500 years, and slowly reduced the period to 364-365 years). the falsification of each and every known religious text begun soon after, in the period 1775-1790 AD. after Adam and Eve joined the one million pairs of humans which already were living beyond the Garden of Eden. Whilst I greatly admire your research and the wealth of information you have accumulated, I do perhaps think that calling this a 'new FAQ' is perhaps unnecessarily controversial. I would certainly support it as an alternative theory, but I do think that presenting it as the de facto new FAQ is perhaps as wise. The information is of great value (I am especially interested in the idea of the Antichone), but it is important that we respect the different viewpoints many FE'ers hold. And the Antichone is Complete Nonsense and Angry Ranting . And you sound so ridiculous with your claims that you must turn hordes away from the idea of a Pancake Planet. Well, you used , so ? It was 84 millions in 3th April. Number of believers are decreased to 78 millions from 84 millions in 21 days. We should focus on the reasons of this event. Maybe they went out and did some experimenting on their own? Could that be it? This drop is a big concern for me. I think we need to get down to the facts immediately. We won't know for sure why people are straying away from flat earth until we interview each person one by one. Brotherhood of the dome, you're doing excellent work. I need you to interview 1,000 people and compare the number of deceived round earth believers with those who know the truth. Please return your findings to this forum immediately. We will simply multiply your results by 7.6 million to get the total number of flat earth believers. If you pronounce "dutchy" a certain way it sounds like that guy from Germany. To me it sounds more like the guy from Italy. So in last 1 year, about 40 millions people have made experiments on their own and decided the flat is earth, true?